William Welch was a native of Norfolk, Connecticut, and one of the most celebrated physicians of his time. Trained at Yale and then at some of the finest institutions in Europe, Welch went on to earn a series of prestigious appointments in the medical field and win an almost innumerable list of awards for his work. The accomplishment for which he is perhaps known best is his contribution to the founding of the School of Medicine at Johns Hopkins University. Born on April 8, 1850, in Norfolk, Connecticut, William Welch lost his mother, Emeline, just 6 months after his birth. Emeline’s family raised Welch’s sister while Welch himself lived with his paternal grandmother and his father—a man who came from a long line of physicians. Welch graduated from Yale in 1870 and earned his MD from the Columbia University College of Physicians and Surgeons in 1875. After serving as an intern at Bellevue Hospital, Welch left for Europe where he spent 2 years studying medicine in Strasbourg, Berlin, Breslau, and Leipzig. When he returned from Europe, he accepted a position to teach pathology at Bellevue Hospital Medical College. 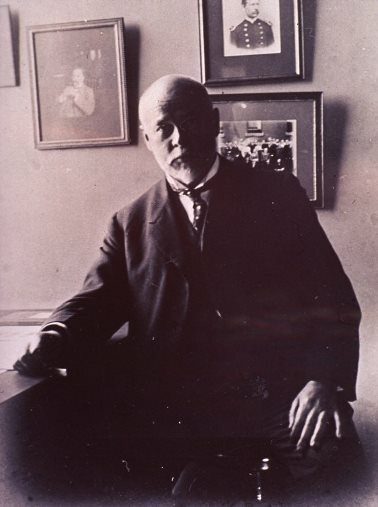 In 1884, Welch agreed to become one of the founding members of the new school of medicine at Johns Hopkins University. His knowledge and expertise in a variety of fields earned him a position as dean of the medical faculty and first director of the School of Hygiene and Public Health. The years that followed seemed filled with a litany of prestigious appointments. After founding the Journal of Experimental Medicine in 1896, he became president of the Congress of American Physicians and Surgeons and president of the Maryland State Board of Health. From 1901 until 1932, Welch served on the Board of Directors of the Rockefeller Institute for Medical Research. During this time, he also became one of the chief advisers of the medical department of the US Army, and from 1913 until 1916, he served as president of the National Academy of Sciences. In February of 1933 Welch came to Johns Hopkins in an entirely different role—that of patient. Welch engaged in a battle with prostate cancer that ultimately claimed his life on April 30, 1934. Over the course of his career, Welch compiled an impressive list of accolades, including 18 honorary degrees, the Gold Medal of the American Medical Association, the Order of the Royal Crown of Germany, the US Army Distinguished Service Medal, and the Harben Plaque for Public Health Service. Today, the William H. Welch Medical Library at Johns Hopkins remains named his honor. “Chronology - William H. Welch.” Medical Archives of The Johns Hopkins Medical Institutions, 2014. Link. “William Henry Welch.” The Rockefeller University, 2014. Link. Silverman, Barry D. “William Henry Welch (1850-1934): The Road to Johns Hopkins.” Proceedings (Baylor University. Medical Center) 24, no. 3 (July 2011): 236–42. Link.